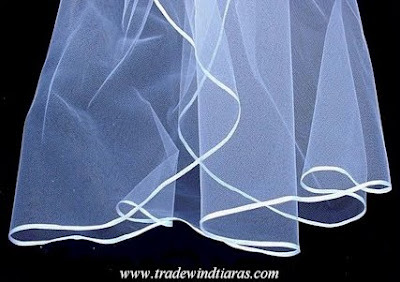 Tradewind Tiaras: Does My Veil Need an Edging? Welcome to the blog for Tradewind Tiaras, Inc. We'll tell you all about our newest products, of course, but we'll also provide great wedding planning tips, showcase gorgeous weddings, and talk about our favorite vendors after 10 years in the business. Visit our main website at tradewindtiaras.com . Does My Veil Need an Edging? Ok, Let me explain. Tulle (whether it's bridal illusion, silk tulle, or English netting) is an interlock fabric, not a woven fabric. What that means (at least the meaning that's important for a bride to know) is that it doesn't fray. No edging is necessary to protect the integrity of the fabric. Really. I promise. I've seen vintage silk veils from the 1920s that still look as perfect as the day they were made. My mother's cut edge silk tulle veil (made and worn nearly 40 years ago) is still in gorgeous condition. Sample veils that we've made and used for years, and have been tried on by hundreds of brides. still have a perfect cut edge. 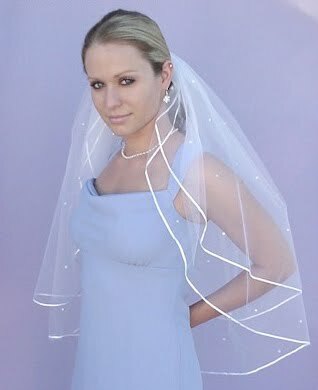 I personally love the simple look of a cut edge veil. It's clean, light, modern and classic at the same time. A cut edge never goes out of style. I think that a cut edge looks especially spectacular on silk tulle wedding veils, with that incredibly flowing, soft drape. Don't get me wrong--cut edge might be my favorite, but I also love the way edgings look. It all depends on the dress, the personality of the bride, the overall look of the wedding. An edged veil can look absolutely exquisite and perfect. 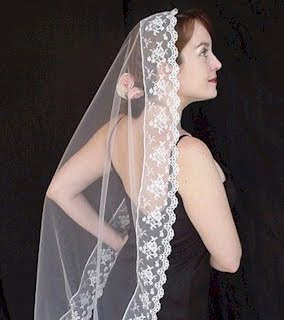 Bottom line, if you love the look of an edged veil, go for it! Just don't think that you have to. Veil with 1/8 ribbon edging. Tradewind Tiaras, Inc. was born when I didn't want to pay $535 for a tiara for my own wedding ten years ago. I love photography, public radio, kayaking, skiing, cake decorating, archaeology, Old English language and literature, Yorkshire pudding, and planning absurdly involved parties for my two young daughters. What is Special about Silk Veils?